This newly converted apartment overlooks the small alpine town of Chateau d’Oex in the Sarine Valley. As well as three comfortable bedrooms, two bathrooms, a spacious salon and well equipped kitchen area there is a south facing balcony along the side of the salon and the master bedroom and a huge and stunning terrace open on three sides which attracts the sunshine throughout the day and looks onto a wonderful mountain panorama. Guests in these award winning apartments have exclusive use of the heated swimming pool, sauna, steam room, fitness room, laundry. Chateau D'Oex : Is a thriving town with an excellent supermarket and traditional food shops. There is a wide selection of restaurants and cafes, together with car hire, sports equipment rental, video rental and daily international newspapers. There are banks, a tourist office, cinema and museum. All denominational churches including Anglican. Year-round concerts, recitals and traditional alpine events. The world-renowned Swiss rail service gives easy access throughout Switzerland and Europe. Pick-up facilities for guests are available from the station and Geneva airport. Summer Activities : Walking along well-marked routes and mountain access via cable cars, skiing at famed Diableret glacier, fishing, white-water rafting and canoeing, mountain biking, cycling, swimming (public outdoor pool), tennis, tenpin bowling, golf (Villars and Gstaad GCs, the latter is an enchanting alpine course with a simple restaurant serving local dishes. Well worth a visit for camp follower and hangers on), mini-golf, horse riding, archery, via ferrata, hot-air ballooning. Gstaad Swiss Tennis Open (July), Menuhin-Music festival, Montreux Jazz Festival etc. High mountain cheese making. Winter Activities : Downhill and cross-country skiing, ice-skating, curling, tenpin bowling, tobogganing, snow-shoeing, winter Wonderweg walks, hot -air ballooning. Farm visits and sleigh rides. Concerts and Recitals - Check with tourist office for regular information sheets. The twin beds in the second room can turn into a decent double bed whilst the third room has two single beds. The building has a lift, and the lower ground floor laundry has washing machines and tumble dryers. The swimming pool has changing facilities, shower, hairdryer and toilets. The building also has a large ground floor seating area with library and card tables. A bar is available, just write down what you drink in the honesty book and pay the house managers for it. Remember it is a bar and not an off licence so buy your bottles in the village and just use this for social drinking.. There is also a downstairs ski room and bike store. Guests will be provided with standard house rules. Great flat with an amazing view! Clean, good location, and very helpful owner. Wonderful amenities - swimming pool and sauna were great. A lovely apartment, very well equipped, in a beautiful location. We knew that we wanted a family holiday in Château d’Oex – this apartment was the perfect location, just a short walk from the village. The apartment is comfortable and very well equipped. We loved eating meals on the terrace with views across the village and the whole valley, and had a wonderful view of the fireworks and bonfires on August 1st. (It would also give excellent views of the hot air balloon festival in January.) In short, we all loved it – and that includes boys of 5 and 8. We were really pleased with the apartment and its facilities. It has a magnificent terrace: a perfect place for relaxing in the sun with a panoramic view across the valley. Chateau D is also a very good location with a character of its own. Sorry to come home. Thanks Richard., glad CD worked its magic on you too. A beautiful apartment, all just as described plus something else that no description can really convey, and that is the feeling of warmth and welcome one has on first entering the apartment. We immediately felt at home and loved every minute of our stay there and only wish we could have stayed longer. As we were due to arrive in the evening Pam had thoughtfully arranged for a welcome pack to be left for us which included everything and more we needed for our first night so all we had to do was sit back and enjoy the comfort and charm of the apartment, and take in its stunning position overlooking the village. As someone who has known Chateau d'Oex for many years I would say that the fabulous panoramic views the apartment has over the village, the lovely valley and surrounding mountains cannot be beaten. Angelo also was everything we had been lead to expect from earlier reviews - friendly, helpful, courteous, efficient and thorough - the Residence itself and its excellent facilities beautifully maintained and spotless at all times. As well as exploring all that Chateau d'Oex itself has to offer we had days out via the cable car onto the local ski slopes at La Braye taking in the fabulous views, the restaurant, snowboarding and tobogganing, trips to Montreux by the panoramic express through glorious mountain scenery and to Gstaad, Les Diablarets and the amazing Glacier 3000 with its new twin peak walkway and panoramic restaurant, and to Gruyeres for the cheesemaking, the mediaeval castle and H R Giger museum. Truly something for all the family. We were lucky enough to spend a week in this apartment at the end of May, though unfortunately the weather this year had a different idea. This made us appreciate the apartment feeling so homely all the more. There is lots of space, very comfy, a pool & sauna and regardless of what the weather is doing the views, especially from the huge balcony are breathtaking. When the sun makes an appearance there is lots to do in and around Chateau d'Oex. We had a lovely train journey to Montreux, a great visit to Gstaad and Interlaken plus there are endless trails and paths to explore and at the end of it all there is nothing better to come back to the apartment and have a nice glass of wine! Chateau d’Oex is a small traditional, French-speaking alpine town – gateway to the Pay d’Enhaut/the white Highlands and its wide range of skiing and the fashionable town of Gstaad. There is easy access to lakeside Lausanne, Montreux and Geneva. Golf: The Gstaad Golf Club at Saanen Moser, a charming Alpine course, welcomes non-members. It also has clubs for hire. There are other golf courses at Villars and nearby Gruyere. 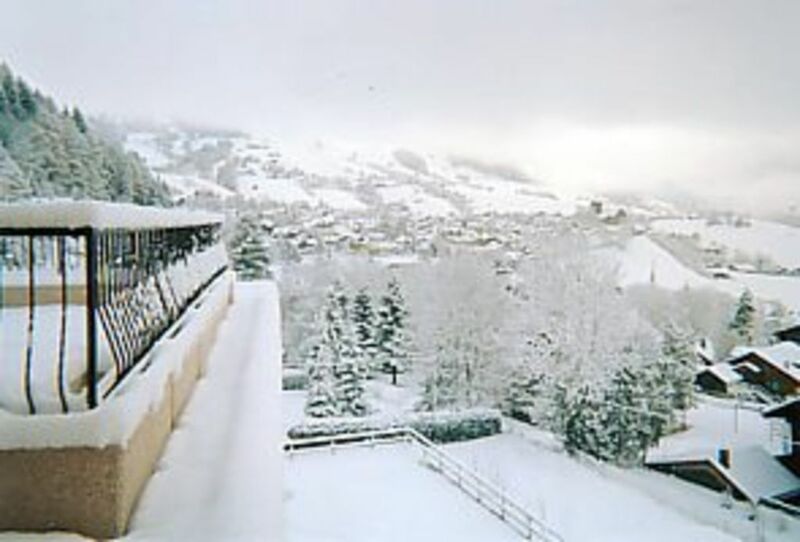 Ski: Chateau D'Oex lies within the White Highlands Super Ski Region, which has 250km pistes and 66 lifts in six areas. Suitable for all standards - two-hour, four-hour, daily or weekly ski tickets available. Excellent instruction, nursery and snow parks for children throughout the area..
Easter, Balloon and Christmas week - check with owner for enhanced rates. Our prices include use of all facilities, bed linen and towels. There is a basic laundry fee of 35 Swiss francs Swiss per person and a cleaning charge of 250 Swiss francs to be added to the rental total which should be paid directly to the Banque Cantonal Vaudois. 25% deposit required at the time of booking and remainder payable three weeks prior to arrival. There is a telephone in the apartment which may be used by arrangement. There is usually a supply of basic herbs and spices and other staples, tea, coffee, sugar, salt, pasta, jams etc. Do please feel free to use them and just replace as required. They are in fact 2000chf per week except for Christmas and New Year which is 2640chf and Balloon week which is usually ten days, not a week, so we work out a price to fit the requirement. There is also an underdground secure parking space available for 100chf prt week.